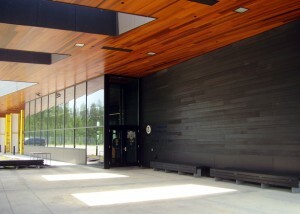 The long, low profile and warm wood cladding of the new U.S. Land Port of Entry in Warroad, Minnesota, blends with the surrounding landscape of marsh, prairie, and forest, welcoming visitors from both sides of the border. The award-winning facility accommodates the latest in security technology and methodology within three buildings, which are linked together by a series of clear-span canopies. 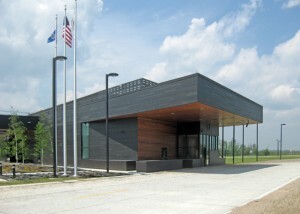 The main structure, a two-story, 34,000 square foot administrative building with secure areas, houses border officers. Inspections of passenger and commercial vehicles are conducted in two additional buildings. 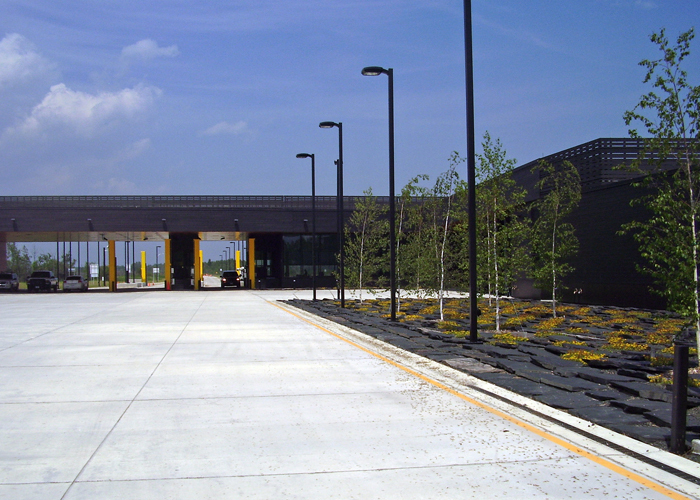 To shield staff from weather and provide maximum surveillance, a 5,000 square foot canopy with a long span of 100 feet covers the inspection area. 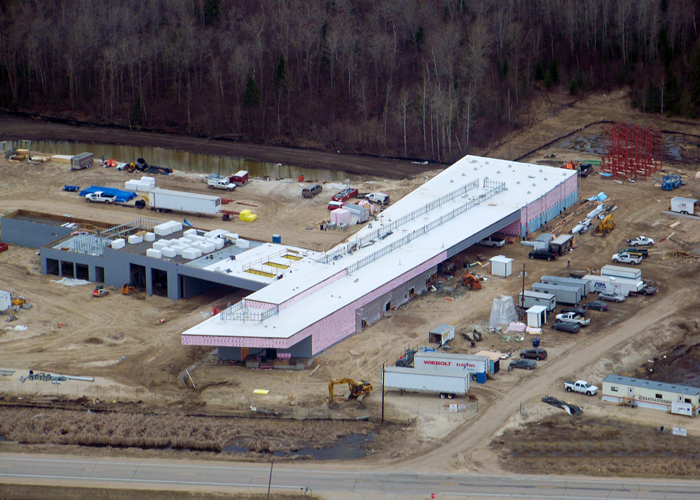 Because of significant onsite geotechnical issues, the main building and a one-mile long secure corridor is pile-supported with slab-on-grade floors. Structural cast-in-place concrete grade beams support the bearing walls and structural slabs of the facility. Load-bearing and shear walls are constructed of concrete masonry or cast-in-place concrete. Expansion joints between each structure allow independent movement of the buildings. Canopies and roofs are constructed with bar joists or structural steel beams. On the canopies where clear-spans must be maintained, bar joists have double-sloped top chords. Steel beams support the cantilevered canopy at the main building. The project took top honors as the 2010 GSA Honor Award winner for Engineering and Architecture, receiving Citations for Construction, Interior Design, and Landscape Design, as well. 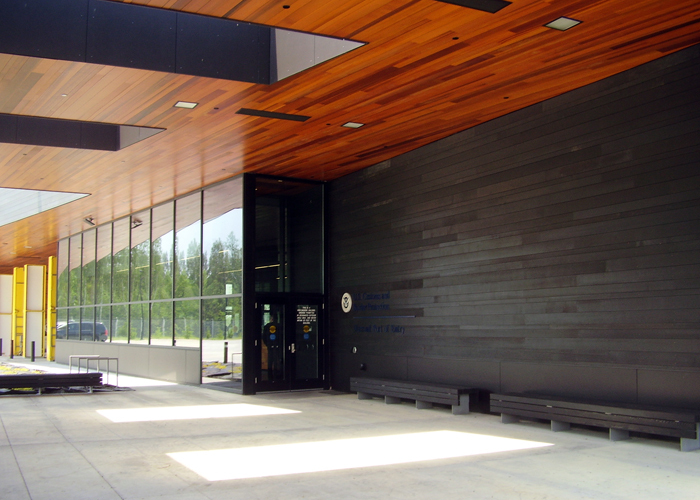 It was nationally recognized by the American Institute of Architects in 2011 with an Honor Award and in 2014 with a COTE (Committee on the Environment) Award. 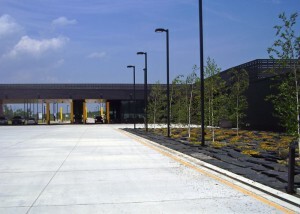 It also received a GSA Design Excellence Citation in 2008.